“Yes, those are the key priorities,” said my CEO as he nodded during our one-on-one. I was stunned and a little disappointed. The whiteboard was covered with more than 20 projects that were on my team’s plate. I was hoping to get clarity on which ones were mission-critical, which were important, which were nice-to-haves and which were pipedreams – because even working long startup hours, we didn’t have the resources to execute them all at once. Speed is the unspoken core value of every high-tech startup, and even as I explained the challenge, my CEO was very hesitant to treat any of the listed projects as a “lower priority” for fear of letting things “slow down.” I was struggling to untie this Gordian knot that I’ve since learned exists in many startups. 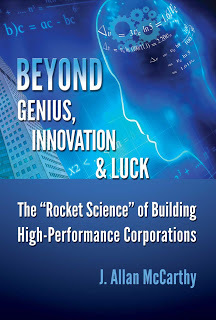 Among the many pieces of wisdom in J. Allan McCarthy’s book Beyond Genius, Innovation, and Luck: The “Rocket Science” of Building High-Performance Corporations is a creative but proven approach that sidesteps the flaws of traditional planning for startups and large corporations alike. Allan was kind enough to share this method and supporting tools in this guest blog post. It’s highly unlikely that your company is using its resources efficiently. Why? The logic on which traditional planning is based is flawed. And, it can introduce huge inefficiencies into the daily operations of a company. On the surface the operational plan might look great and make sense—but if it doesn’t use “sequencing” as the organizing principle, then behind the scenes that same plan is draining productivity by as much as 15% to 27% (1) or more. No kidding. How much money does a 15% to 27% productivity loss equate to? You can do the math for your company. It could be a few million dollars in an early stage organization to hundreds of millions of dollars in lost productivity (and related market opportunity) in a large corporation. The company defines its vision and purpose. This is why the organization was formed, where it’s going, and what it will look like when it gets there. Leadership will also define its mission statement or “What they are striving to achieve”—looking out 18 to 24 months. Next, a string of high-level objectives are typically identified (let’s call these imperatives). Then the functional leaders (Sales, Engineering, Marketing, R&D, Finance, etc…) identify the work needed to be done, meaning, list the key projects and programs in order to achieve these objectives (let’s call these initiatives). The Initiatives identified by the functional leaders are then aggregated into a plan. That’s when the fun begins. Bright, motivated leaders debate priorities and make a case for resources. I call this “resource roulette” because at this juncture, resource allocation might as well be gambling since the logic on which it is based is severely flawed. Why? When there is a high interdependency between imperatives and initiatives, which is the case in almost every modern-day corporation, then sequence, or the order in which work is performed (like building a house) becomes extraordinarily important. When building a house, a foundation must be built first. There is no debate about this. Next, walls must be erected before plumbing and wiring can be installed. No one would dream of putting on the roof before the walls were built—and in reality it couldn’t be done. When one builds a house, there isn’t debate about priorities. The house is built on the basis ofsequence or the logical order in which work needs to be accomplished. And here in-lies the root problem: organizations are very, very complex systems (even start-ups) with a high sequential relationship between imperatives (high level objectives) and initiatives (where the work gets done)—but this sequential relationship isn’t obvious. The “sequence” is further hidden when bright, energetic functional leaders act independently to create their respective plans of work to be performed. Without a sequenced-based plan, the organization is doomed to essentially work against itself as an army of motivated employees pursue goals and objectives that aren’t in unison. A CTO Group in a large corporation was struggling with their ability to meet general company objectives, made worse by a perceived lack of headcount and funding. The group had 111 employees and an $83M annual budget (excluding R&D capital). Prior to beginning the planning refresh cycle the current plan documents showed: 8 imperatives and 126 initiatives that the 7 CTO Group executives had aggregated from their various departments into a plan. After refreshing the Mission Statement, we identified 10 imperatives that were needed in order to achieve the Mission. Next, we mapped the 126 existing initiatives to the new Imperative set. See column #1 “New Imperatives Identified in Plan” and column #2 “Existing Initiatives Mapped to Imperatives.” Examine the Initiative count by Imperative. (Note: At this stage you can’t read the actual Imperative description to know if, for example, 32 Initiatives is the correct loading for Imperative #1. We’ll save that discussion for a later time.) To this point Initiatives have been identified and put in motion based on executive debate over priorities. Remember, building a company is like building a house. There is always an inherent sequence that should be the organizing principle on which a plan is based. Now let’s demonstrate the impact of sequencing as the organizing principle of the plan. Next, the executive team performed a very simple sequencing activity (on the new ten Imperatives) called the Interrelationship Digraph. I’ve seen companies invest only a few hours of time in this kind of exercise and literally save months of wasted person-hours of effort on out-of-sequence execution. This is a common sequencing tool used for a variety of applications. After sequencing (see lower portion of Excel spreadsheet green and red areas) we learned that Imperatives 8, 5, 4, 3, and 9 (ordered high to low) were the drivers or, keeping with my sequencing metaphor, building the foundation and walls of the house. In other words, these Imperatives needed to be finished (or at least significant progress made) before the lower in sequence Imperatives could be efficiently completed. It turned out that Imperatives 1, 10, 6, 2, and 7 (in this order high to low in sequence) were the followers or the wiring, plumbing and roof of the house. Notice that at this stage there is no debate about priorities! So, for example, it’s very difficult to build a sales plan without a market analysis. This is a no-brainer. 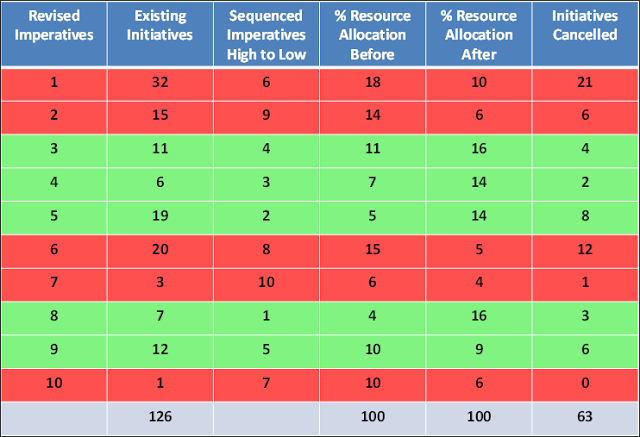 Unfortunately, with literally hundreds of initiatives in queue in most companies, it’s very difficult to determine where these might fall in sequence unless there is an explicit mechanism in place to identify it. 63 of the 126 existing Initiatives were cancelled or suspended. These were deemed too low in sequence or simply unnecessary at this point in time. 22 new Initiatives were added—not in anyone’s queue—and deemed mission critical; 14 of these addressed high in sequence Imperatives. 32% of the allocated resources (headcount and dollars) were rebalanced from low in sequence Initiatives to high in sequence Initiatives. The executive team’s confidence level grew and the weekly staff meeting debate ended over headcount and dollars. The CTO Group executive team’s confidence in plan execution grew significantly. Stakeholder confidence and sponsorship increased exponentially. The CTO also presented this plan to the CEO and Board of Directors (CTO had previously been challenged by the BOD on his resource requests). He received accolades for plan composition and transparency. Is the organizing principle behind your company’s plan sequence or prioritization? I’ll bet it’s the latter. This means that you’ve got hidden treasure in terms of significant productivity gains awaiting discovery. Now, go get it. (1) Research performed on 87 companies between 1999 and 2009 pre and post planning process results. Planning process documented inBeyond Genius, Innovation & Luck: The “Rocket Science” of Building High-Performance Corporations, J. Allan McCarthy, November 2011, 4th Edition Publishing, available at Amazon.com.